While many cities in the world boast of having huge parks, it is rare to find a forest reserve in a city centre and folks in Kuala Lumpur can be proud that their city is home to one of the oldest tropical rainforest reserves in Malaysia. The KL Forest Eco-Park, located near the KL Tower, is the last stretch of permanent forest in the city. Sadly, most residents (myself included) have not found the time to appreciate this ancient green lung has to offer. On a recent Saturday morning, I found myself amongst a group of writers at the Jalan Raja Chulan entrance, waiting for the guide to take us on one of its many walking trails. Of the original gazetted land area of 17.5 hectares (KL Tower stands on part of the land), the Forest Eco-Park has been reduced to only 9.3 hectares but some of the trees here are several hundred years old. It used to be known as Bukit Nanas (Pineapple Hill) Forest Reserve, as pineapples used to be grown around its perimeter. The hill (94m above sea level) also served as a main tin storage compound in the 1820s. Pineapples used to be planted around the hill as defence strategy by a Malay leader named Raja Asal. According to Heritage Malaysia (www.heritagemalaysia.my): “It is said that in 1871, Bukit Nanas, which at the time was not known by this name, was made a fortress by Raja Asal. To stop his enemies from entering his fortress, Raja Asal planted pineapples around the hill. "In those days it was normal for people to go about barefooted and the spikes of the pineapple plant served as an effective obstruction." Unfortunately, it didn't work and Yap Ah Loy's followers, with the aid of Tengku Kudin and the British in Selangor, managed to infiltrate the "pineapple fortress". 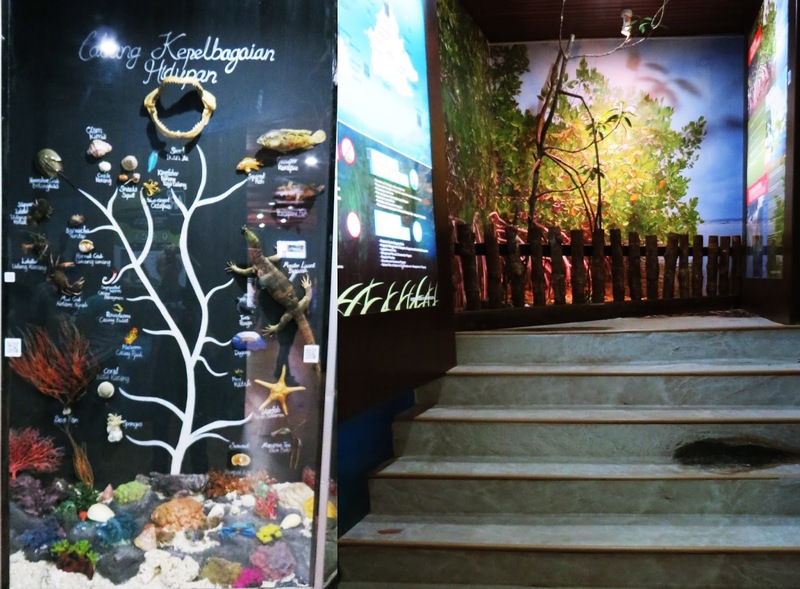 For more information about the park, the Information Centre at the Jalan Raja Chulan entrance has a small exhibition area and Interactive Gallery comprising photographs and graphic illustrations of wildlife. We learnt that the Forest Eco-Park is home to snakes, two species of monkeys, squirrels and 25 species of birds including white rumped shama and scarlet breasted flowerpecker. The guide said that if we were lucky, we might even catch sight of monkeys or a raccoon or two. Unfortunately, we didn’t. As we walked, he pointed out various trees such as camphor, jelutong, karas, kapur, palms and bamboo as well as the giant liana vine (imagine Tarzan swinging through the forest and holding on to these) and herbs of interest, including two species of the infamous Tongkat Ali (Eurycoma longifolia), a root herb taken to boost male virility. A huge attraction of the Forest Eco-Park is a 200m canopy walk that offers a splendid aerial view of the city beyond the tree tops. At the fence separating the forest from KL Tower, we watched playful raccoons at the Tower’s mini zoo compound. There are as many as 10 trails that criss-cross the forest. Apart from the Canopy Walk and Hanging Bridge, these include the Jelutong Trail (where a giant Jelutong tree stands), Bamboo Walk (with clusters of bamboo), Suboh Trail (Denai tree – its wood is used for railway sleepers), Denai Trail (Penarahan tree), Shorea Trail (Meranti tree), Sindora Trail (Dipterocarp forest), Hopea Trail (Merawan tree) and Merawan Trail (Merwan tree). KL Forest Eco-Park may be accessed from various entrances, such as via Jalan Raja Chulan, Jalan Ampang, Jalan Bukit Nanas or from KL Tower. © Copyright Tan Bee Hong. Simple theme. Powered by Blogger.